The school year is going by peacefully… There were some changes in the student groups at the beginning of the year. This happens frequently, as youngsters in this region are often called upon by their nomad families to help out. As always, their places in school were swiftly taken by new children, who integrated very easily into the school community, sure sign of a remarkable sense of solidarity. This year, we have also participated in the construction of a multifunctional building in the Dzogchen valley. Its purpose is to shelter students for the duration of the reconstruction work to their school and dorms, to host extra-curricular activities, and in the long term, fitted with a restaurant and a coffee shop, to host travelers and visitors to Dzogchen in order to generate some income for the school. 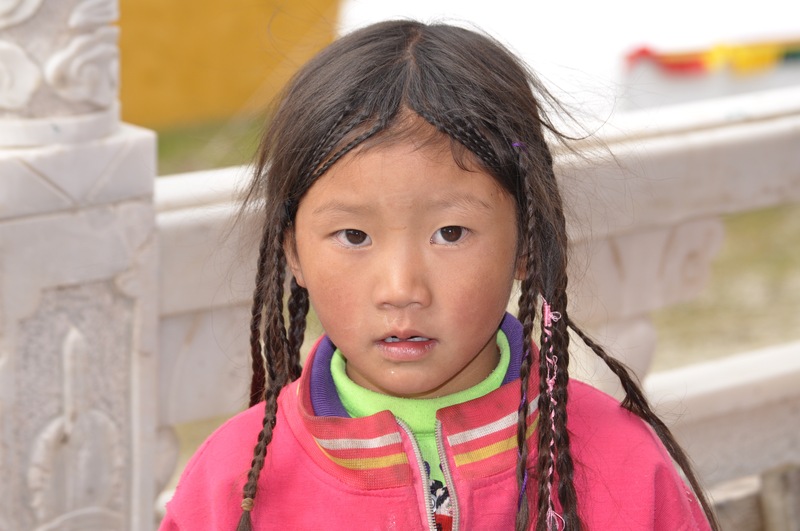 Traveling to Tibet and getting close to Tibetan children, you are always struck by their joy and their lust for life. And whenever there’s an event somehow connected to their culture—a horse race, Tibetan song and dance, helping out at the monastery—their energy is doubled and their eyes sparkle. Of course, if you know Tibetan, it is much easier to get close to them and enter into a truly gratifying encounter and exchange… You can’t but notice, however, how the influence of modernity grows ever stronger, raising the stakes when it comes to preserving one’s identity. The obvious question is how this new generation of Tibetans will be able to maintain its identity, all the while evolving within a China developing at top speed. The only valid answer seems to be… through education, in their habitat which is the Tibetan plateau: a modern education, yet respectful of Tibetan culture so deeply infused with the buddhist values of wisdom and compassion. This is the challenge accepted by the Zangdok Palri association over fifteen years ago, when it created a school-orphanage in Kham province, in Dzogchen. And a considerable challenge it is: the harsh climate, the costs of student infrastructure, the difficulty in finding skilled and reliable teachers, the logistics of sheltering, feeding and clothing 30 to 40 people… all this at an altitude of 4,000m. And of course, one or two trusted people are needed to manage the entire operation throughout the year. Back to the children… During our last visit to Dzogchen this summer, what surprised us most was the children’s eagerness to study right there in their native country in order to preserve their culture. The elder students especially demonstrate a deep sense of belonging when it comes to their school; they are very much aware that they are on a common adventure and wish to see every single student succeed. In other words, each student seems genuinely invested in his studies, each according to his abilities, of course. We might ask ourselves whether there is a real need for this school, as there is also a local Chinese school. There is of course the fact that this Chinese school doesn’t have the necessary infrastructure to provide the indispensable lodging for children from nomad families. On top of that, however, just like here in Europe, each school has its own character, defined by its vision, the human qualities of its teachers, its social setting, the values instilled through its curriculum… We have come to the conclusion that tomorrow’s Tibet absolutely needs a school-orphanage of this type. Salted butter tea, Tibet’s traditional tea, is perfectly suited to the harsh living conditions in the Himalayan high plateau. It nourishes, energises, and fights altitude dehydration thanks to the added salt. The nomads consume it in great quantities, both as a drink and mixed with tsampa, the grilled barley flour which is their staple food. In Tibet, butter tea is prepared using milk from the dri, the female yak. This milk has a much stronger taste to it than our cow’s milk. To serve 4, use 75 cl of water, 1 bag or knob of black Darjeeling tea, 1 tablespoon of cow’s butter, 25 cl of full-cream milk, and some salt. Bring a pot of water to the boil, add the bag or knob of tea and bring to the boil again. Remove the tea, add salt, butter and milk, and mix until perfectly blended. With your help we are able to further develop this project of hope!